Anh Nhu Nguyen, 52, admitted fraud and on Friday, February 9, he was jailed for 21 months at Southwark Crown Court. The inferno, which claimed 71 lives, continues to have a big social and political impact on the UK. In the hours and days after the fire there was a great deal of confusion about the number of people who lived in the tower block, which was managed by KCTMO, on behalf of Kensington and Chelsea Council. ​It emerged KCTMO did not have a proper list of all the tenants and leaseholders and in the confusion Anh Nhu Nguyen managed to fool the authorities that he lived in Grenfell Tower and his wife and 12-year-old son had died in the blaze. Vietnam-born Nguyen, who has 28 previous convictions dating back to 1983, three years after he arrived in the UK. He told journalists he had escaped from his 15th floor apartment after covering himself with a wet towel but said his wife and son had failed to make it out. Nguyen was pictured next to Prince Charles when the heir to the throne visited a memorial wall near the tower a few weeks after the fire. Judge says events at Grenfell are “seared into the mind of anyone who has known about that tragedy”. Tells Nguyen genuine victims are “appalled that somebody should seek to benefit when others have lost their lives in this terrible tragedy”. ​Nguyen obtained £12,500 (US$17,200) in cash, clothing, food and electrical items from the council and various charities and was put in a hotel after pretending to be a survivor. But Nguyen had never lived in the tower block and had an apartment in south-east London. He had simply shown up in the aftermath of the fire and claimed to be homeless and grieving. Nguyen claimed to have lost all his possessions in the blaze and spoke emotionally about seeing dead bodies in the hallways of the tower as he struggled to get out through the thick smoke. He claimed he was trying to contact relatives in Hong Kong who would want to come over for the funeral of his wife and son. Detective Superintendent Matt Bonner said many people had suffered the most harrowing night of their lives on June 14 but Nguyen sought to profit from their misery. "As part of our response to the fire dedicated officers were deployed to support those who had been affected and when inconsistencies emerged in Nguyen's story we began an investigation to discover whether he had been telling us lies," Det. Supt. Bonner told Sputnik. There was no evidence Nguyen had been treated for smoke inhalation at St Mary's Hospital in Paddington, as he had claimed and checked with neighbors of the apartment on the 15th story where he claimed to have lived showed he had never resided there. In fact he lived miles away in Bromley, south east London. "Pretty much everything he claimed was not true. He did not have a wife and child and he had never even been in the tower," Det. Supt. Bonner told Sputnik. "I would like to praise the tireless work of the officers who responded to the gaps in his story and completed a thorough investigation," he told Sputnik. Despite pleading guilty, and all the evidence to the contrary, Nguyen still maintains he was in Grenfell Tower, court told. Judge says he has spun an “elaborate series of lies”. Defence say he has an “astonishingly low IQ”. ​Nguyen was charged with two counts of fraud by false representation and one count of making an untrue statement for the purpose of obtaining a passport, having claimed his own was lost in the fire. In court his lawyer said Nguyen's IQ was in the bottom 2.5 percent in the UK. But Judge Philip Bartle did not accept that as mitigation. ​"You knew full well what you were doing. You knew you were taking advantage of those genuine victims at this terrible time," he told Nguyen. "The effect of what you have done has been considerable on those who have genuinely suffered, when you have not," added Judge Bartle. 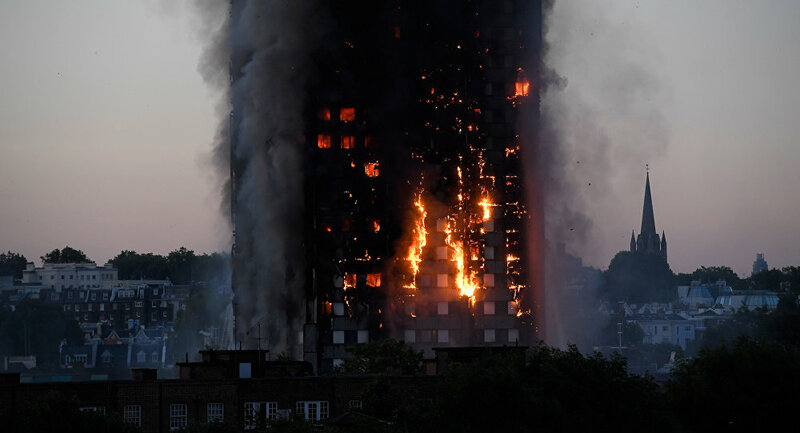 The fire, believed to have been caused by a faulty refrigerator, broke out in the early hours of June 14 and spread rapidly throughout the tower block, trapping many residents on the upper floors. The rapid spread of the blaze has been attributed to flammable cladding which was fitted to the side of the building during a refurbishment. Reports have suggested it was chosen over an inflammable alternative because it was a few thousand pounds cheaper.